There’s something about the wilderness. The fresh air. The green leaves. The tall tress. It would be a shame if everything…oh I don’t know…just went up in smoke now wouldn’t it? That’s exactly where Firewatch wants to trap you. Firewatch is one of those indie titles that completely flew under my radar the first time it was formally revealed, which made its first trailer release almost like a debut. It’s a heavily-stylized, first-person adventure that is part mystery, part slow decent into insanity? 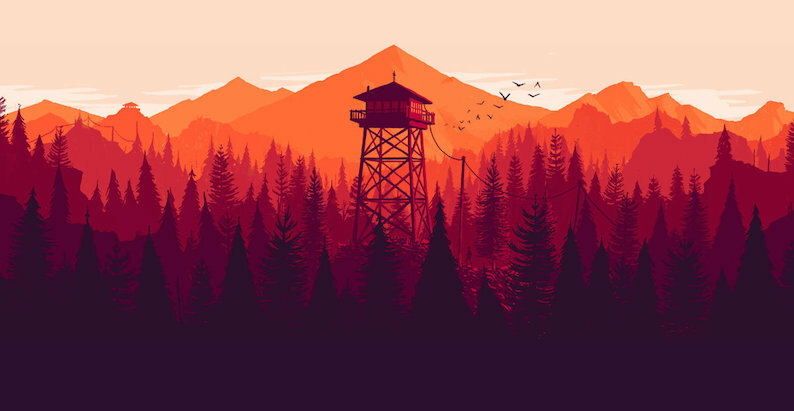 Firewatch puts you in control of Henry, a lonely watchman in the absolutely gorgeous Wyoming wilderness. Again, the gorgeous wilderness. Developers Campo Santo have opted for a heavily stylized approach with this rather unique first person adventure, and it the reason why it stands out. Personally, I’d take this over photorealism any day. As for the gameplay, well there isn’t much below. You do get the sense that Henry is slowly losing it, with his only contact to the world being a mysterious friend on the other end of a walkie talkie. He’s trapped in a leafy bomb that could literally ignite at any moment. How would you deal with it? Firewatch is out next year on PC, Mac and Linux. It’s hopefully coming to consoles soon after.